Ongoing loss of forest cover in the Philippines places it among the top ten most threatened forest hotspots in the world, with the archipelago ranking fourth, behind Indo-Burma, New Caledonia and Sundaland (a region encompassing Australia and parts of Southeast Asia). According to a report issued by Conservation International, only seven percent of Philippine forests remain intact. This high rate of forest loss is especially troubling as the Philippines is considered to be one of the most biodiverse countries in the world – so much so, that scientists have termed it “megadiverse.” The United Nations World Conservation Monitoring Center ranked the Philippines 25th among countries with the highest numbers of bird, mammal, reptile, amphibian and vascular plant species. Scientists estimate 10,000 plant and animal species inhabit the Philippines, many of which are endemic to the country. The Philippines has lost more than half a million hectares of forest since 2001, and very little intact forest remains. 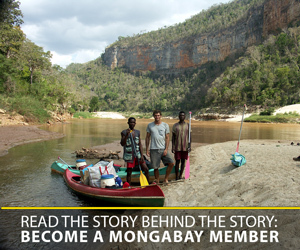 While logging has been banned throughout the country, illegal logging remains rampant. Courtesy of Global Forest Watch. Click to enlarge. Among the Philippines’ many species found nowhere else in the world is the Philippine eagle (Pithecophaga jefferyi). One of the world’s largest birds of prey, the Philippine eagle has declined dramatically in just the past 50 years, owing to extensive deforestation. Estimates vary, but surveys indicate no more than 340 breeding pairs currently exist. According to data from Global Forest Watch, the Philippines lost more than 600,000 hectares of forest from 2001 to 2013, representing two percent of its total land area. In 2010 alone, the country lost more than 100,000 hectares. In addition, FORMA alerts, which indicate the likely presence of recent forest damage through satellite data, are ramping up, with a nearly three-fold increase from October 2013 to April 2014. Logging is a primary contributor to forest loss in the Philippines. From 2008 to 2013, data from the Philippine Department of Environment and Natural Resources (DENR) shows that timber harvesting increased its output volume by nearly 30 percent from 2008 to 2013, and the country’s production of veneer doubled during that time. 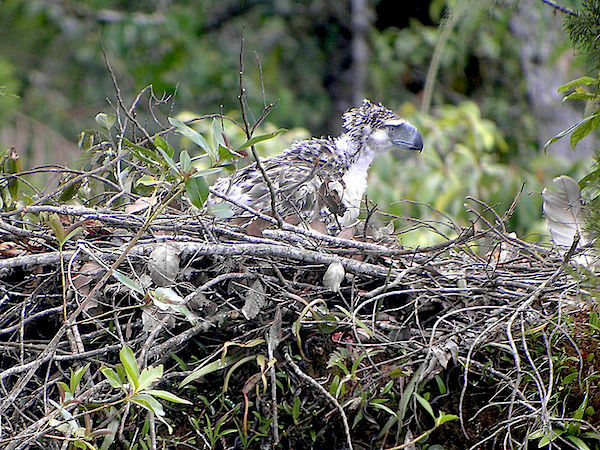 A Philippine eagle (Pithecophaga jefferyi) on its nest. Deforestation has taken a big toll on this species, with fewer than 400 breeding pairs currently left in the wild. Photo by Mark A. Harper. In addition to reduced habitat for the country’s wildlife, deforestation is also impacting the country’s human populace. Without tree roots to stabilize hillsides and hold water in the soil, landslides and flooding become more commonplace. This has been tragically demonstrated during the many environmental disasters faced by the Philippines in recent years. In response, logging was banned in the Philippines in 2011. However, illegal logging still continues at a high level, especially in the southern part of the country (Minfanao). 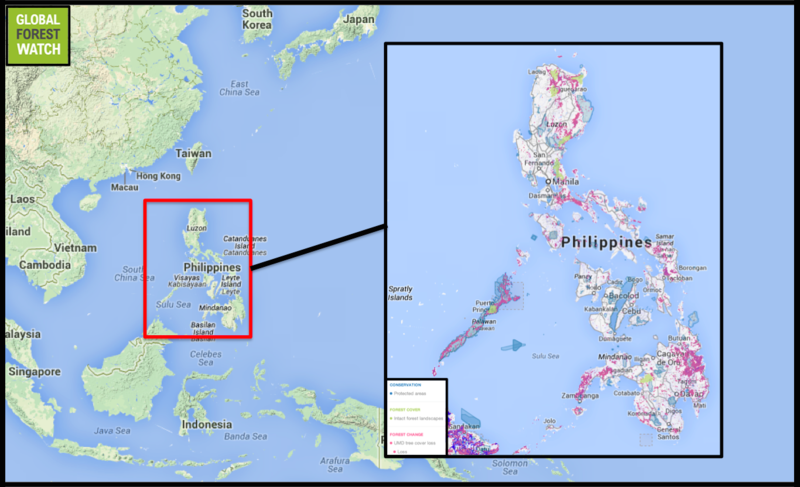 The Philippine government has begun some conservation initiatives to help repair the situation. In 2011, the DENR started the National Greening Program (NGP), which intends to help the forests regrow by planting 1.5 billion trees on 1.5 million hectares of land across the country in five years. The government has invested $25 million (P10.977 billion) over the past four years, with $13 million (P5.8 billion) invested in 2013 alone. The planting areas include active and inactive mining sites, urban areas under local government’s greening program, mangrove forests, and upland forests. According to the NGP accomplishment report, they have finished about 46 percent of the entire project. (04/09/2014) The notion of spiders using ants as bodyguards seems a bit contradictory, but that is exactly what occurs on the tropical forest floors of the Philippines. The jumping spider strategically nests within the vicinity of the aggressive Asian weaver ant as a defense tactic against its main predator, the spitting spider. (01/21/2014) Scientific American) magazine recently ran an article on the rediscovery of the smoothtooth blacktip shark (Carcharhinus leiodon) in a Kuwaiti fish market. Believed extinct for over 100 years, the smoothtooth had not been seen since the naturalist Wilhelm Hein returned from a trip to Yemen in 1902. With its reappearance, scientists scoured Kuwaiti markets and discovered an astounding 47 individual smoothtooth blacktips. (11/25/2013) As temperatures increase worldwide due to anthropogenic climate change, scientists are scrambling to figure out if species will be able to survive rapidly warming ecosystems. A new study in Global Change Biology offers a little hope. Studying reptiles and amphibians in the Philippines, scientists say some of these species may be able to seek refuge in cooler microhabitats, such as tree holes or under the soil, in order to stay alive during intensifying heatwaves. But, the scientists’ stress, the shelter from microhabitats can only protect so far.